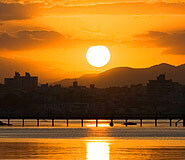 Discover Florianopolis during your price guaranteed Brazil vacation. All of our Brazil tours have daily departures and are fully customizable. Capital city of southern Brazil’s Santa Catarina State, the strikingly beautiful beach resort town of Florianopolis attracts nationals and tourists alike thanks to its exquisite beaches and majestic scenery of lush Atlantic forest, which provide the backdrop for this modern metropolis. The natural, rustic beauty offered by this resort co-exists effortlessly alongside a booming tourism and information technology industry that has made Florianopolis one of the nation’s wealthiest per-capita states. Visit this breathtaking Brazilian beach town during your tailor-made Florianopolis vacation, a travel value made easy with the travel experts at Brazil for Less. The city of Florianopolis is an epicenter for surfing activity in the region, and with more than 40 white-sand beaches, lovers of surf and sun could not ask for a better Brazil vacation destination. Hit Joaquina or Moçambique beaches for idyllic surfing conditions, or visit the majestic Conceição Lake which features shallow waters and high winds, making it ideal for windsurfing. The area’s green forests, full of Brazilian wildlife, are ideal scenery for a relaxing nature walk or hike. Aside from sunbathing on the immaculate sands of Joaquina Beach or surfing the crystalline waves of Matadeiro coast, Florianopolis offers a variety of eco-tourist activities such as hiking through the city’s forests at the Praia da Galheta national reserve. 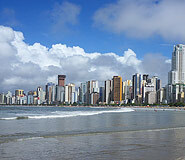 Fishing is ideal at Barra da Lagoa, which features the largest fishing colony on the entire island. Another fantastic way to enjoy the landscape of Florianopolis is to take a boat trip to view the city’s historical ports and witness marine wildlife, such as dolphins, swim the crystal blue waters that surround the city. As expected, this highly developed island city is home to some of the region’s finest restaurants, first-class shopping, and pulsating night life. Dine at exquisite Italian eateries, but don’t miss out on the delectable, fresh seafood dishes the city is known for. High-end shops and large shopping malls are scattered throughout the city; Beira-Mar Norte located on the coast offers spectacular views while you spend. Finally, Florianopolis provides some of the most exciting nightlife in the area, with glamorous night clubs catering to the city’s young and hip crowd. 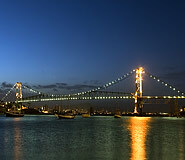 While the Florianopolis nightlife has a distinctively modern edge at night, in the day time hours, travelers can visit the city’s historical sites to view examples of beautiful colonial architecture from the Portuguese era. The Metropolitan Cathedral and the Church of Our Lady of the Lagoa da Conceição are both stunning illustrations of colonial Florianopolis’ past. It’s always a good time to visit Florianopolis, for the most part. The first 3 months of the year are the high travel season when Brazilians flock to their favorite destinations and beaches to enjoy the summer sun and evening heat of the clubs. During this period of January to April, the days buzz along in the cozy mid-80°F (26.5°C) range and the evenings linger in the mid-60°F (15.5°C) range. March and April are the locals’ favorite time to frequent Florianopolis because the waters are still warm from the summer but the crowds have gone back home. May to June has plenty of wind creating waves for surfing, but the water gets to be quite chilly, perhaps requiring the use of a wetsuit. The nearby university populations ensure that the city’s nightlife lives on healthily. August to October usually features waves too furious for the first-time surfer, but it is the perfect time for wind and kite surfing, not to mention whale spotting. November and December days and evenings are pleasant all around. The Argentina and Brazil trip organized for us by Brazil for Less was great. The timing and amount of time for each place was very balanced and we were able to see a lot of things in a short amount of time. We also appreciated the ground staff arranged by Argentina for Less in the five different countries (Brazil, Argentina, Chile, Peru, and Ecuador) we visited, who, without fail, arranged for us to meet and depart on eleven separate flights at all hours of the day. Having personal transfers from airports to hotels (and vice versa) and to be picked up and delivered at our hotels before and after tours took so much of the stress and uncertainty out of the trip. Diane and Jim Anderson, Victoria, BC Canada. Guests at this illustrious resort will have the privileged opportunity to experience a natural reserve of rugged cliffs, soft beaches, green pastures, open-air archaeological museums and clear blue lagoons. Many rooms include balconies with stunning ocean views and some even boast a private Jacuzzi. If you are seeking true luxury and intimacy, the hotel’s villas are of the highest quality and provide extra space and privacy. A wide range of cuisine is offered through six restaurants offering exquisite regional, international, French, and Italian cuisine, and a beachfront grill offers a selection of grilled meat and churrasco during the high season. In addition to all these amazing facilities, heated indoor and outdoor swimming pools, a nightclub, and numerous sports and activities are available at the hotel. Rated among the best hotels in Brazil, the Costão do Santinho successfully strives to blend luxurious tourism with ecological responsibility, and provides guests with the highest quality service in town. Offering breathtaking views of Baia Norte, the excellent Blue Tree Towers Florianopolis truly holds up to the high standards of service and quality of the Blue Tree chain. Conveniently situated in the center of town, alongside the Beira-Mar shopping mall within walking distance of all of Florianopolis’ attractions, this beautiful hotel features 95 comfortable rooms all equipped with amazing amenities including air conditioning, wireless internet, immersion bath, two telephone lines, digital safe, cable TV, and mini bar. Enjoy delicious dishes at the Pimenta Limao restaurant, sip a cocktail at the Lobby Bar, or relax in your room and take advantage of the 24h room service. Among the excellent amenities of the Blue Tree Florianopolis are a swimming pool, steam sauna, and fitness center. Conveniently located 50 meters from the beach and only 6 miles (10 km) from the airport, the charming Pousada Natur Campeche hotel offers first class service and comfortable rooms for excellent value. This peaceful hotel surrounded by beautiful lush gardens is a great place for those looking for serenity and comfort, yet wish to have opportunities for all types of activities right at their fingertips. The hotel staff will gladly help you organize any sports activities or tours you may wish to partake in during your stay. Guests will also enjoy the exquisite cuisine offered at the restaurant, and take advantage of the on-site pool, Jacuzzi, sauna, game room, hammocks, and even holistic rooms offering relaxing massages.